It was all quiet on the phone line. Inside a building on the campus of Cal Poly San Luis Obispo, a deconstructed, acrylic-mounted LightSail clone was sending out radio signals. On the roof, flanked by the rolling hills of California's Central Coast, a radio antenna listened. The simulation began. "Mission, this is ground systems," said a voice on the phone. "We have AOS (Acquisition of Signal)." The automated radio chirps coming from BenchSat, the LightSail test clone, now streamed into a rack of Cal Poly servers. There, the chrips were converted into text files containing 87 lines of information about the spacecraft's health. From temperature readings to gyroscope data, it was all there. The chatter on the phone was NASA-like. Participants identified themselves by function in a way that would fit right in at Houston's Mission Control Center. It was all part of LightSail's Operational Readiness Testing, or ORT. This particular ORT session simulated the spacecraft deploying its solar sails as it flew over the Cal Poly ground station. LightSail's signal strength is just one watt—on the order of a cell phone. But that's plenty powerful to send telemetry back to Earth and let engineers know how everything is going in space. The ground station pass ended as abruptly as it began. BenchSat's signals fell silent, simulating the spacecraft moving out of range. It was time to regroup and see how everything went. 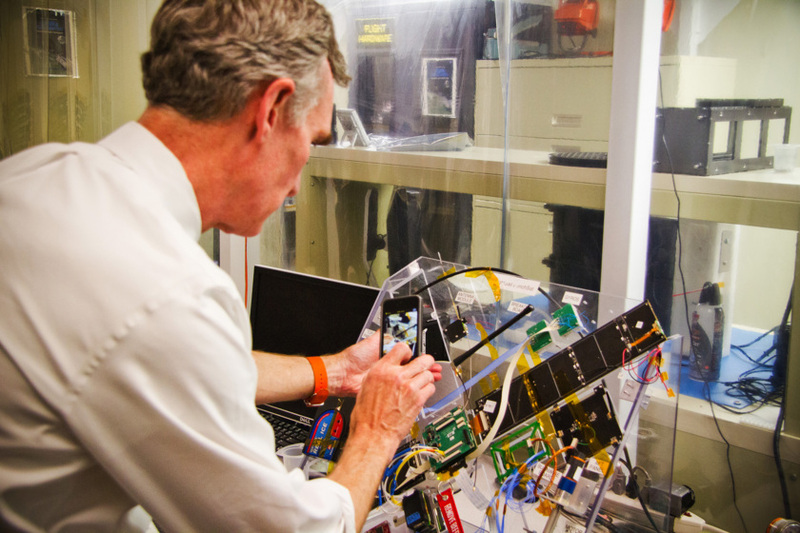 Planetary Society CEO Bill Nye snaps an image of BenchSat, the deconstructed, acrylic-mounted LightSail clone, at Cal Poly San Luis Obispo in August 2014. It was early April. On the other side of the United States, students at Georgia Tech were playing the role of mission management. They began sifting through the BenchSat telemetry files, and something caught the attention of one eagle-eyed engineer: Many of the sensor values hadn't changed from chirp to chirp. This wasn't necessarily a problem. After all, BenchSat wasn't flying around the Earth at seven-plus-kilometers per second; it was just sitting on a table at Cal Poly. System engineer Barbara Plante was on the line from her Bay Area office. 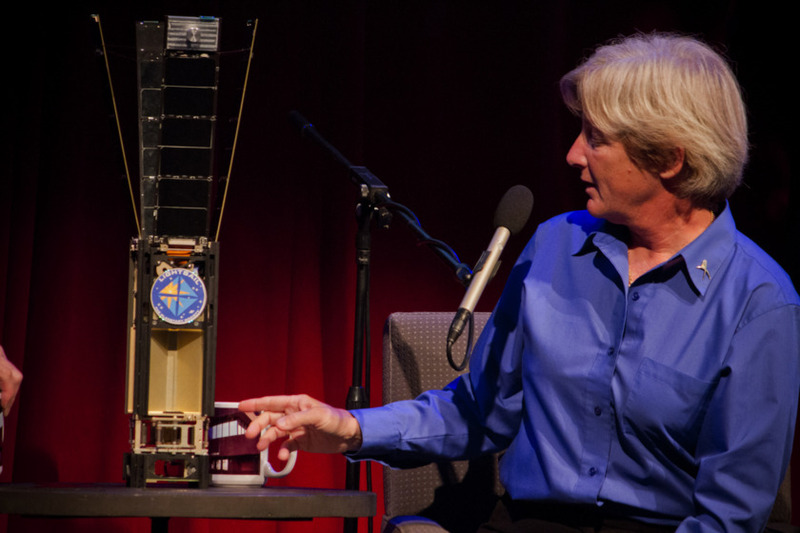 She devised an easy way to make BenchSat's sensor values change: Turn the spacecraft on its side. "I said, 'Alex, Can you rotate BenchSat?' I knew that we’d get some gyroscope data out of it," she said. 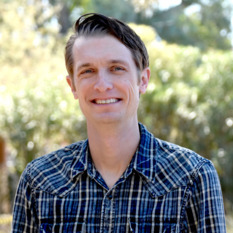 Alex Diaz, a LightSail software engineer and Cal Poly graduate, agreed with the plan. "We have four magnetometers," he said. "If you move the spacecraft 90 degrees, sensor one should look like sensor three." Diaz moved BenchSat. BenchSat chirped some more. But the telemetry values didn't change. "Nothing happened," Plante recalled. "So we said, 'This is a problem." Problems, of course, are to be expected. The primary goal of the LightSail test flight—currently scheduled for May 20—is to run through the sail deployment sequence in Earth orbit. The spacecraft won't fly high enough for solar sailing; this is merely a dress rehearsal for the second flight in 2016. Problems are not only expected, they're welcomed—a bug found now is a bug that can be fixed for next year. Dave Spencer, the Georgia Tech aerospace professor in charge of LightSail's ORT, typed up a problem report for the frozen telemetry. It's an innocuous document—a one-sheet PDF that gets its brevity through engineering jargon. "ACS processing is not invoked at the nominal rate of 2Hz," reads one sentence. In the 1995 film Apollo 13, flight director Gene Kranz, played by Ed Harris, tries to focus his frazzled staff with a brief speech. "Let's work the problem, people," he says. "Let's not make things worse by guessing." Plante and Diaz did just that. Their investigation quickly centered on a section of software related to LightSail's Payload Interface Board, or PIB. As the name implies, the PIB controls the spacecraft's payload, including the sail motor and sensor suite. LightSail runs on a Linux operating system. Its functions are coded in the C programming language. One of the first things newbie coders learn is the power of IF THEN logic. It's the most basic way to tell a computer to check a condition and do something based on the result. This same type of logic is used to continually collect data from LightSail's sensor suite. It also commands the spacecraft's Attitude Control System, or ACS, to stabilize LightSail against Earth's magnetic field. Late last year, as the LightSail test unit fended off a barrage of last-minute hardware problems, a change was made to this section of code. Unfortunately, a bug was also introduced that keeps some of the spacecraft's sensor data from being funneled into the automated telemetry signals. It has also impacted the ACS system—exactly how much is still, as Gene Kranz might say, being worked. Plante and Diaz are carefully analyzing the situation, and another Operational Readiness Test is planned for the first week of May. LightSail team members analyze telemetry data following a sail deployment test at Cal Poly San Luis Obispo in September 2014. Alex Diaz (left) and integration lead Riki Munakata (right) wear blue coats and hairnets. BenchSat sits on the table in front of Munakata. Project Manager Doug Stetson is optimistic. He says even in the event of a disabled ACS, LightSail should stabilize over time as it trawls through the edges of the atmosphere. While a fully functional ACS is preferred, the spacecraft's natural motion should be sufficient for communications—unless the team gets very unlucky. Furthermore, Stetson says the most critical components of the LightSail test flight are unaffected. This includes solar sail deployment and operation of the spacecraft's onboard cameras. Diaz and Plante are also looking for ways to funnel frozen sensor data around the affected software routine. 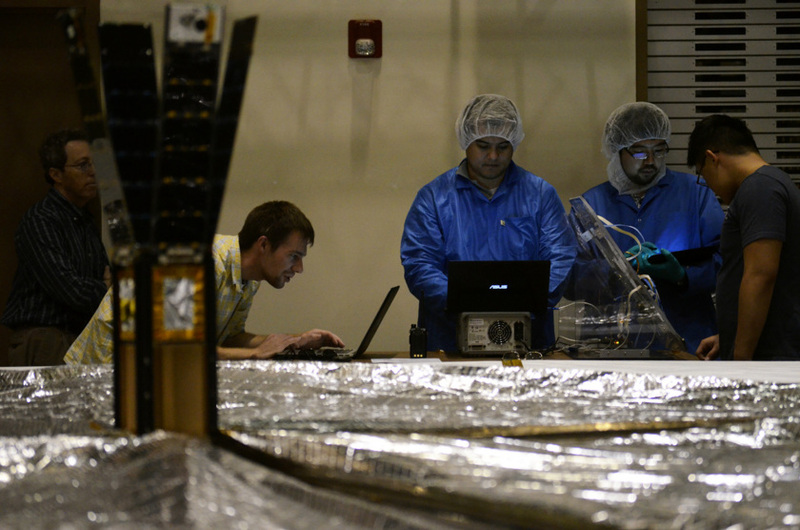 LightSail has no on-orbit software update capability—yet. While the test flight unit is already bolted to an Atlas V rocket at Cape Canaveral, Plante is working on a way to add this functionality to the 2016 LightSail mission. Long before the bug was discovered, the team began working with ground-based observatories capable of imaging the spacecraft with its sails deployed. If communications problems stymie the download of onboard imagery, these telescopic images will provide confirmation that the deployment sequence worked. Backyard astronomers may also be able to help with the effort—The Planetary Society will publish a map showing the spacecraft's real-time location and ground track. At the 12th annual Cal Poly CubeSat Workshop this week, Ecliptic Enterprises Corporation CEO Rex Ridenoure gave a brief LightSail presentation. One of his slides was titled "LightSail-A Issues Resolved." The long, bulleted tally—which contained the disclaimer "(Partial List)"—was both disconcerting and uplifting. From blown radio amplifiers to broken burn wires, the LightSail test unit has been through a lot. But each problem, including the newly discovered software bug, has been an opportunity to fix something ahead of the 2016 flight. In fact, it just wouldn't seem right if the May test mission didn't involve some extra excitement to keep things interesting. For more on LightSail, visit sail.planetary.org. This is what flight testing is all about. Good luck for the R&D test run! I wonder if there's a way to also use the sail itself as an antenna dish? With a surface that large it should help greatly with communication reception.